Acupuncture has been used for over 3000 years - as far back as 1000BC. Acupuncture is one of the many skills used within physiotherapy for the management of pain and inflammation and to stimulate the body’s own healing chemicals in order to aid recovery. Acupuncture stimulates the brain and spinal cord to produce NATURAL pain relieving chemicals (endorphins), melatonin to promote sleep and serotonin to promote well-being. A physiotherapy assessment is carried out to determine the source of the imbalance and the correct acupuncture points required to help the body return to a state of health both physically and mentally. This allows other physiotherapy treatments such as exercise, muscle strengthening and rehabilitation to achieve more effective results. Acupuncture is a very safe procedure. The needles we use are pre-sterilised, disposable needles and these are usually left in place for 20-30 minutes. 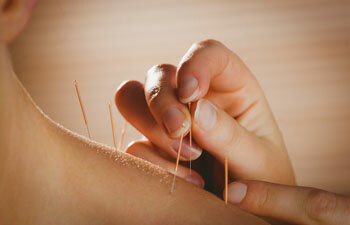 Acupuncture needles are the same width as human hair and so does not feel the same as having an injection. The overall number of treatment sessions required will depend on you, your condition and your physiotherapist’s assessment. Most patients receive a course of 4-6 treatments although just one or two treatments may be enough. Sometimes 1 or 2 ‘top up’ treatments are required. Treatments are normally given at 1-2 weekly intervals. The effects of acupuncture treatments are cumulative: different people respond in different ways and at different rates. Some people may feel an immediate relief of their symptoms whilst others may only see a gradual improvement after a few treatments. Some people may find that their condition/symptoms flare up for up to 24 hours after the treatment but then see a marked improvement. To book a session with Grosvenor Street Physiotherapy, please contact us. Please try to give 24 hours notice if you are unable to attend any appointment. Failure to do so may result in appointments being billed directly to yourself unless we are able to fill your vacancy. Discretion may be exercised on a case by case basis. We strive to provide a quality service within a relaxed and caring atmosphere. If however you have any queries or concerns, please do not hesitate to contact us. Keep up to date on our latest news, events & discounts.